This year’s Presidential election has to be one of the most divisive and fundamentally polarizing contests in a long time. Whether its Black vs White, Rich vs Poor, Democratic vs Republican, Liberal vs. Conservative, you can clearly see a distinct difference in each candidate’s target audience – at least from a marketing strategy perspective that is. Their backstories go something like this: President Obama has lived the American Dream, raised by a single-mother, worked his way up the ranks to become President working to help the middle-class and the underserved. Romney by contrast, born into wealth, keeps off-shore bank accounts and questionable tax records and earned a paltry $20 million last year looks to help big business and wants to tax the poor to help the rich (allegedly). Jokes aside, I wanted to take a look at the font choice: Trajan Pro. 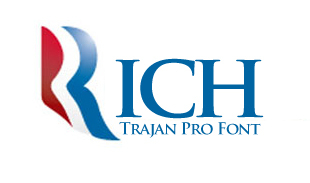 Anyone that is familiar with my firm’s work, knows that we love Trajan Pro. We use it often because it’s a great Display (headline) font for anything that is upscale or elegant. 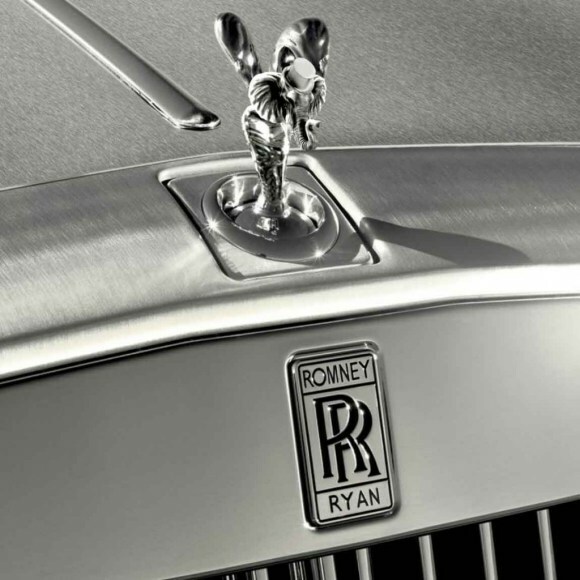 In the case of the Romney campaign logo, does the use of Trajan Pro caters to their upscale, higher tax-bracket, wealthy audience? Trajan Pro just looks ‘Elegant and Wealthy’ doesn’t it? You fancy, huh? 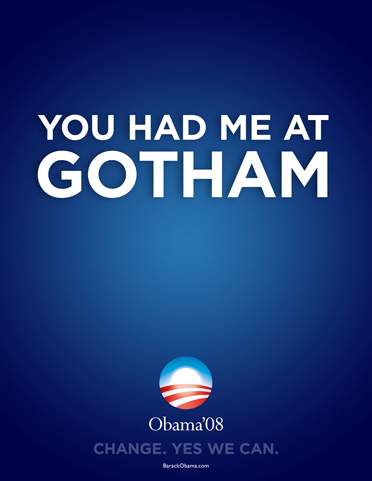 The particular campaign logo above uses the serif font Perpetua, which is fancy, but later on it was changed to Gotham, a sans-serif font designed by Tobias Frere-Jones in 2000. 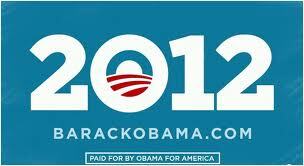 “Sol Sender’s design for the 2008 Obama campaign reset the standards for campaign logo design. 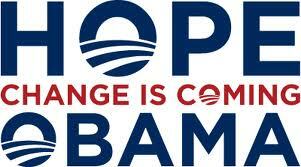 His iteration for the 2012 re-election is less revolutionary but no less sophisticated. The sun rising over the American fields emblem, which the campaign presumes is now so recognizable that this is all is needed to signify the president, has taken up residence in the 0 of 2012. The choice to reverse the text in white out of cornflower blue feels fresh and bright, and still hopeful. The typographers Hoefler & Frere-Jones created a custom slab version of Gothic [Gotham] with serifs for the 2012 campaign and so the numerals are made of blockier bolder stuff than they were in 2008. Let’s just hope the man is too. Well – maybe I’m the only one paying attention to which font each candidate uses, but I find it fascinating that the fonts used in this Presidential race, so appropriately reflect the candidate’s message. 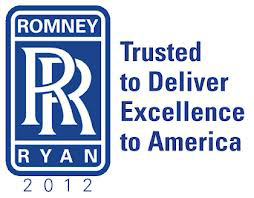 Romney’s choice of font speaks to the rich and Obama’s choice of font speaks to the middle class. So who will you vote for in this election, the elegant and wealthy ‘Trajan Pro’, or the common, font of the people, ‘Gotham’? You can answer that in Comic Sans please. Ramon has over 19 years of experience in award-winning, market-proven, print collateral, marketing material, iphone/ipad app and website design specializing in corporate identity and branding. Ramon’s passion for entrepreneurial design was borne out of 10 years as Creative Director for Jay Walker at Walker Digital, the Stamford based idea laboratory and business incubator holding over 300 US Patents. Ramon served as Senior Art Director on the start-up launch team behind Priceline.com, a Walker company and invention. Most recently, Ramon’s logo and identity work was selected to be published in “Typography and Enclosures” the fourth book in the Master Library series by LogoLounge.